Grey’s Anatomy has a character problem. There are just too many people running around Grey Sloan Memorial Hospital these days. 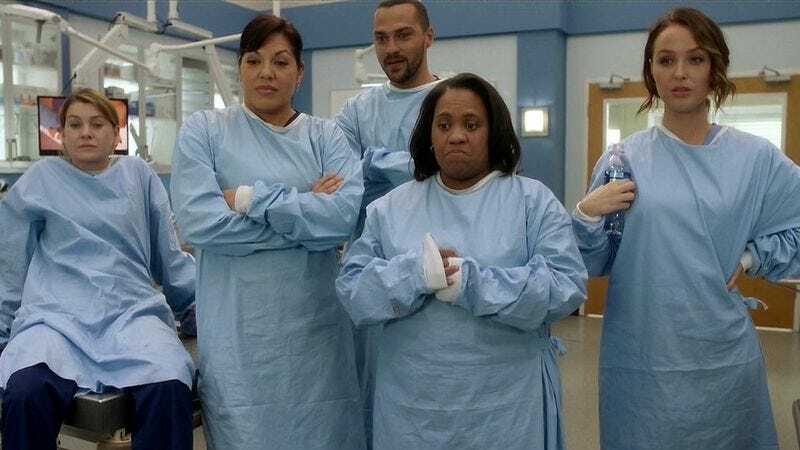 Sure Grey’s has always been an ensemble show, but in the early days there was a clear core of five interns to follow, while Meredith’s relationships with Derek and Cristina grounded the series. Now, however, there’s no real focus or shape to the ensemble. Meredith is still the show’s lead, but everyone else hovers in a weird middle ground of importance. Each week the show has to decide whether it wants to narrow in on a random set of characters or try to cram in as many of them as possible. “All Eyez On Me” chooses the latter approach, which leaves the episode feeling both overstuffed and underdeveloped. 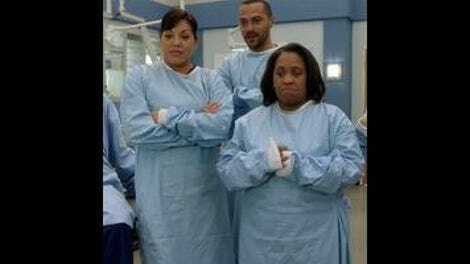 At first, however, it seems Grey’s is going to deep dive into the hospital’s “Dream Team”—Callie, Meredith, Bailey, Jackson, and Jo—as they travel to a military medical center to perform a risky leg removal/reattachment surgery on a cancer patient. But a potentially powerful storyline about how those five characters work together under stressful conditions quickly becomes diluted by one too many side plots. Back at Grey Sloan Memorial we get face time with just about every member of the main cast (for the record that’s Maggie, Riggs, Deluca, Karev, April, Penny, Stephanie, Hunt, Ben, Amelia, Arizona, Webber, and some guy named Spencer I swear I’ve never seen before) as they deal with two separate medical crises and one personal one. After stretching out the drama of Maggie and Deluca’s secret affair for far too long, Karev finally tells Maggie that no one cares about attendings dating interns anymore. That’s true of both the hospital staff and the show’s audience. We’ve seen this secret romance plot play out god only knows how many times before, and Grey’s doesn’t manage to bring anything fresh to it in this umpteenth revisiting. It’s a massive relief when Maggie finally agrees to go public with their relationship, although Deluca’s concerned face implies those two aren’t out of the drama-filled woods yet. Elsewhere, Ben and Stephanie get to handle crashing psych patients and catty cheerleaders, respectively. Considering Ben and Stephanie are two of the show’s least defined characters, I understand the impulse to make them a focus in this episode, but neither storyline gets enough room to breathe. The reveal that Stephanie used to be a cheer captain and knows exactly how to handle a group of insubordinate teenage girls is fun, and Jerrika Hinton sells the hell out of it, but it doesn’t feel like a strong enough payoff to such a meandering subplot. Meanwhile Ben is busy channeling MacGyver as he slices open a patient with a clipboard when there are no other sharp objects available in the psych ward. Potentially fueled by insecurity about the fact that he’s an older resident, Ben takes action rather than waiting for help to arrive. He later argues he was putting his experience to good use to save a patient, but Webber and Bailey both believe he took an unnecessary risk, even if Bailey is ultimately impressed by her husband’s creativity. Perhaps this is setting up an arc about Ben’s recklessness, but right now it feels like it comes entirely out of left field for a character who has so far been defined mostly by his dependability. But the most disappointing thing about “All Eyez on Me” is that it doesn’t tie its various cases together in a satisfying thematic way. I thought for a while that teamwork would be a big theme of the episode, with the dysfunction of the cheer squad mirroring the dysfunction of the underprepared Dream Team. But instead, the cheerleaders exist mostly to remind Penny, Deluca, Stephanie, Maggie, and Karev that the hospital is just like high school—a point Grey’s has made many, many times before. In fact the Dream Team plotline doesn’t even really touch on the concept of teamwork. Instead it’s mostly a showcase for Callie, with Bailey, Meredith, Jo, and Jackson squirreling away their nuts (i.e. completing their tasks) without a hitch while she has to improvise when she discovers her initial plan won’t work. It’s nice to see Callie at the forefront of a Grey’s storyline, particularly one that touches on her job rather than her dating life. She’s a character who tends to get lost in the shuffle of the big cast, but for my money she’s one of Grey’s best creations and a fairly unique female character within the larger TV landscape. Callie fluctuates between extremes, switching from insanely confident to incredibly insecure at the drop of a hat. But there’s a consistency to her personality shifts that makes her more realistic not less, which is a hard trick to pull off. But while Sara Ramirez turns in a characteristically great performance, we just don’t spend enough time with Callie for her story to really resonant. Her crisis is conveyed in the least visually interesting way possible (she just paces in a hallway), and the fact that she decides to work out a problem alone rather than, I don’t know, consulting with the five other doctors working alongside her seems incredibly stupid. Yes Meredith gives a big speech that pushes Callie to think outside the box, but what’s the point of creating a Dream Team if not to explore their team dynamics? The episode wants to play up the drama between the visiting doctors and the permanent military medical staff (namely Scott Elrod’s chiseled Major Thorpe), but it does so in a way that feels both contrived and anticlimactic. Callie goes into a surgery underprepared, thinks up a solution on her own, and winds up pulling off a medical miracle—that’s hardly compelling character development. The other thing missing from this episode is a patient to root for. A compelling guest player can do a lot to elevate a so-so episode, like the recovering mom trying to turn her life around last week or the dying fire fighter captain from the midseason finale. “All Eyez On Me” tries to insert some pathos with overstressed cheerleader Maxine and the soon-to-be father-of-three combat veteran who is undergoing Callie’s surgery, but, like most things in this episode, they wind up getting lost in the shuffle. There are two or three really great story ideas in “All Eyez on Me,” but in trying to stuff them all into one episode, Grey’s proves that more is often less. I have a feeling this episode is laying ground work for the rest of the season, particularly when it comes to establishing the military medical center and its patients and doctors. (“We’ll be sure to follow up,” is repeated a lot tonight). It’s just too bad all that world-building couldn’t take place within a more compelling stand-alone episode. So it looks like Major Thorpe is Meredith’s first post-McDreamy love interest! I have no idea how long he’ll stick around, but the last thing this show needs is another main cast member, particularly with Riggs, Deluca, and Karev already fulfilling the handsome brunette white guy quota. To be fair, Grey’s has basically been practicing sci-fi medicine for the past few seasons, but sticking a guy’s leg onto the middle of his body seems particularly insane, right? Is no one going to bring up the additional social burden of having such an unusual physique? Also Meredith mentions there’s no back-up plan when the surgery gets rocky, but couldn’t they just amputate both of his legs and still leave him cancer-free? In an episode full of pointless plots, Jackson maybe flirting with that military doctor takes the cake.